Why Your Future Vaccination Might Not Be A Shot : Goats and Soda Step aside, injections! The next flu vaccine you see might look more like a bandage — a patch covered in 100 microscopic needles that dissolve in the skin in just a few minutes. 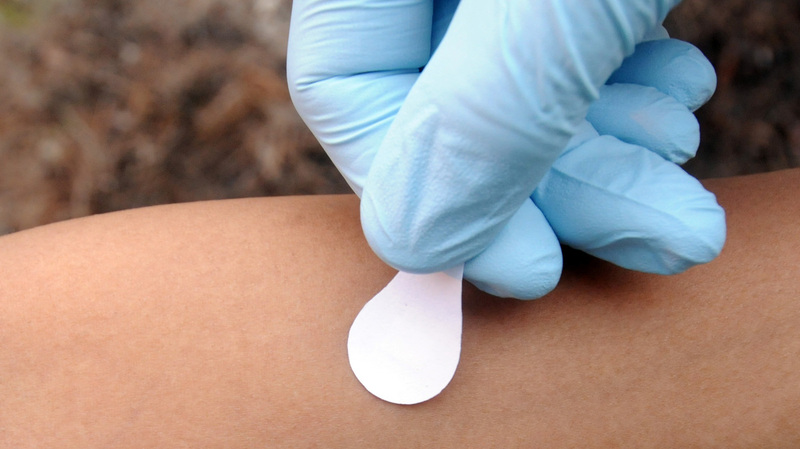 A patch that's the size of a nickel could one day administer the measles vaccine. Vaccines don't always make it into the people who need them the most. Many require a syringe and a needle to enter the bloodstream and create immunity. And that means a doctor or nurse has to do the job. But with if a vaccine could be delivered by simply applying a patch? That's Mark Prausnitz's goal: creating a nickel-sized bandage-like device covered with 100 microscopic needles that would puncture the skin, then dissolve to get the vaccine into the body. Maybe that sounds scary — 100 needles instead of one. But Prausnitz says you can't really feel the needles. "It wouldn't be like sandpaper or scratching," he says. "You would have a hard time feeling a difference between the needles being there or not being there." Prausnitz started working on the patch more than 20 years ago. He's a professor of chemical and biochemical engineering and the director of the Center for Drug Design, Development, and Delivery at Georgia Tech, and he's collaborating with the Centers for Disease Control and a group at Emory University. 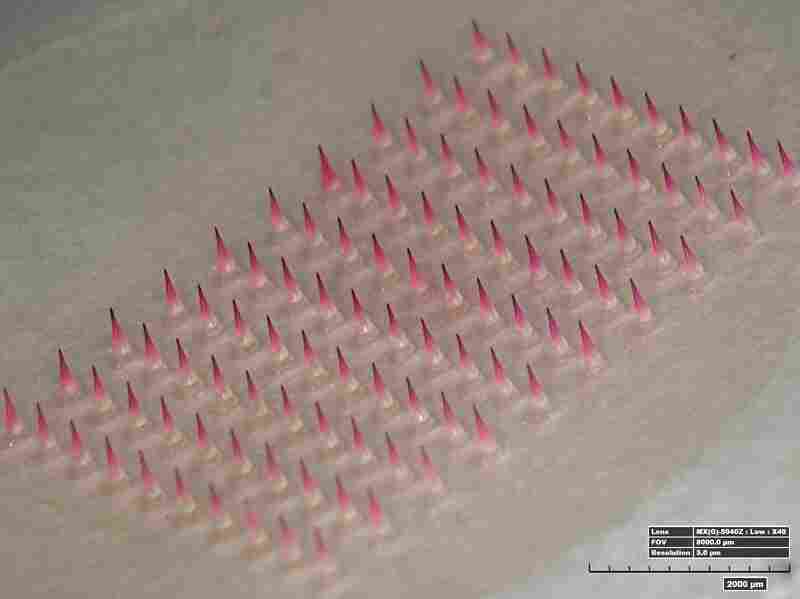 A magnified image shows a patch with its microneedles dyed pink. The patch looks like a small teardrop. The large, round part is covered with needles and the narrow end acts as a tab to hold onto. "The microneedles are small, so it just looks like something shiny on the surface of the patch," says Prausnitz. He and his colleagues make the patches using a mold they built themselves, forming the microneedles from a solution that includes the vaccine, sugars and polymers. They let the solution dry overnight and pull out a sheet of microneedles in the morning. First up for a patch trial? The measles vaccine. Currently, many people in the developing world must travel to a clinic to receive the measles vaccine — in part because that's where the doctor or nurse is and in part because that's where the refrigerators are, which are needed to keep the vaccine working. Putting the vaccine in a patch eliminates the need for a medical professional and a refrigerator. "It would enable us to get the vaccine to a lot more people," says Prausnitz. The patch has another advantage. No needles to dispose of — so no risk of health workers getting stuck with a discarded needle. Once the patch is pulled from a person, the needles are gone and the patch can be tossed. The measles patch has successfully completed testing in animals, and the CDC estimates that testing in humans will start in 2017. Measles isn't the only targeted disease. This summer, Prausnitz will run a small trial with about 100 volunteers using a patch flu vaccine. "We would like people to ultimately self-administer their flu vaccines," he says. But to keep the testing consistent and keep his volunteers safe, only professionals will apply the patches for this trial. The vaccine itself will cost the same whether it is piped into syringes or embedded in patches. But it's hard to compare the cost of manufacturing microneedles with the fluctuating cost of full-size needles. "At the end of the day we don't know how much it's going to cost to make millions [of patches]," says Prausnitz. Then again, how do you put a price on an ouchless vaccine?